Jan. 9, 2019—One appropriate way to get to know and appreciate Founding Father Alexander Hamilton’s vision and accomplishments for our nation is to get acquainted with his pioneer project in manufacturing, the Society for Establishing Useful Manufactures (known as S.U.M.). Fortunately, the efforts of numerous historians and the Hamilton Partnership for Paterson group have devoted themselves to educating the nation on this subject. The Partnership’s President, Leonard A. Zax, describes the group as the Friends of the Paterson National Park, although in many respects, the group appears to have been the park’s own Founding Father. It was formed to ensure that the 35 acres around New Jersey’s Passaic Great Falls would be preserved and turned into a center for education about Hamilton’s 1792 project. Its efforts were successful in 2009 when Congress passed legislation to create the Paterson Great Falls National Historical Park, located in the city of Paterson, New Jersey at the site where Hamilton established the S.U.M. The park itself is still in the process of implementing the Master Plan presented in 2008. The plan can be accessed here. As the National Park Service worked on elaborating management plans for the park, more testimony, in the form of public comment, was proffered which enriched the picture. From among these documents I have chosen to excerpt a letter written by Professor Richard Sylla, professor emeritus at the New York University Leonard Stern School for Business, in 2012. Dr. Sylla is on the Partnership for Paterson’s National Advisory Board, along with Ron Chernow and others. Professor Sylla’s letter was written to the Park Service to elaborate the central role of Alexander Hamilton (as opposed to others such as Tench Coxe) in the Paterson manufacturing project, and thus provides a more in-depth picture of Hamilton’s devotion to manufacturing than simply recounting his role with the S.U.M. I think you will find it quite informative. 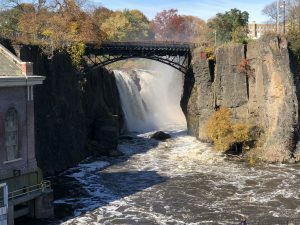 … The Paterson Great Falls is the place that Alexander Hamilton selected to begin implementing his far-reaching plan to make America a great industrial nation. 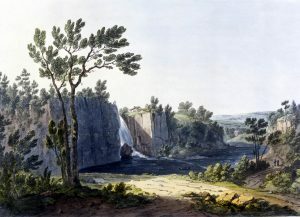 The Paterson Great Falls National Historical Park should emphasize Hamilton’s role in founding Paterson and establishing the foundations of America’s might in manufacturing industries. These industries were instrumental in achieving America’s economic independence from foreign powers and opening up economic opportunities, both for native-born Americans and for generations of immigrants to our country. There are many compelling potential interpretative themes for the Paterson National Park, including economic independence, immigration, innovation, economic opportunity, renewable energy, and perseverance. Hamilton would play a critical role in every one of them in Paterson. Hamilton was the foremost proponent during the founding era of America’s need to develop manufacturing. An immigrant himself, Hamilton quickly threw himself into debates about British colonial policies and whether America ought to seek independence. Still a teenager, he wrote two essays, A Full Vindication of the Measures of Congress (1774) and The Farmer Refuted (1775), that have repeated references to America’s need to manufacture and its ability to do so. These quotations from 1774 and 1775 give the lie to the contentions that Hamilton only much later in time took up the cause of American manufacturing, and that when he did so he relied for most of his ideas on the thinking of Tench Coxe, one of his assistants at the Treasury Department from 1790 to 1795. Coxe was a proponent of American manufacturing, but there is no evidence that he became such before Hamilton. During the War of Independence, moreover, when Hamilton was an officer in the New York and Continental Armies, Coxe was a Tory merchant profiting from dealing with the British forces when they controlled New York and Philadelphia. Only later did he come over to the American cause after it became clear that the Americans would prevail in the war. There is even a ridiculous notion that Coxe wrote most of Hamilton’s famous state paper, the Report on Manufactures of 1791. Coxe did do a first draft, most likely at Hamilton’s request. It is published in The Papers of Alexander Hamilton, Vol X, covering 8 pages. That volume also shows four drafts by Hamilton of the Report, using some of Coxe’s short draft and not using other parts of it, followed by the final version which comes to 111 pages. As a professor and researcher, I am used to using research assistants, and they can be most helpful. In my opinion, Coxe was Hamilton’s research assistant, and a good one because, like Hamilton, he believed in America’s manufacturing potential and had a lot of factual knowledge about the existing state of manufactures in the US of 1790. The S.U.M. did struggle in its early years after building the first mill. That plan did not work out as hoped in the turbulent 1790s. But the corporation, rather than failing, soon achieved considerable success as an incubator of other manufacturing enterprises. It did so by using the powers that Hamilton wrote into the S.U.M. charter to provide power from its waterworks, to rent the production facilities it had built there to others, and to lease sites for others to build factories. Providing critical inputs and space to nascent firms is exactly what modern manufacturing and industrial incubators do, and in that sense the S.U.M. was an early version of the incubator concept. 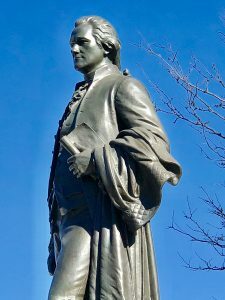 Hamilton envisioned it as a pilot and learning project that would serve as an incubator of manufacturing start-ups and a stimulus to industrial entrepreneurship in Paterson and elsewhere in America. In the long run, the S.U.M. succeeded in realizing that vision, and it was the long run that mattered most to Hamilton. Paterson quickly became a center of the U.S. industrial revolution, and in time fulfilled the original vision by producing a wide variety of manufactures that included Colt revolvers, locomotives, submarines, and aircraft engines. While, therefore, the hopes of the founder proved unduly sanguine, for those who were able and willing to wait the Society’s stock became a highly profitable investment and the corporation itself no insignificant factor in promoting the development of a `considerable manufacturing town.’ The event has thoroughly justified the farsightedness, if not the sense for immediate profit, which was shown by original entrepreneurs. Foremost among the original entrepreneurs, of course, was Alexander Hamilton. I hope that my letter helps to counteract any claims that Hamilton was not in the forefront of Americans promoting manufacturing in the founding era, that his relationship to the S.U.M. and Paterson was limited, and that the S.U.M. itself was a total failure. The historical record is chock full of evidence that contradicts such claims. The S.U.M. at Paterson, our first planned industrial community, was to be a concrete embodiment of Hamilton’s vision. The original plans for the city and its manufactories were the product of the famous immigrant architect Pierre L’Enfant, who also left a large imprint on Washington, D.C. The raceways L’Enfant and others designed to channel waterpower to manufactories are still there. Paterson grew up as an important, diversified manufacturing center around the site. Many evidences of that development as it played out over the course of the 19th century remain, for example silk mills, locomotive works, and the site where Colt fist began to manufacture firearms. Much of Hamilton’s 1791 vision is thus preserved at Paterson. Also at Paterson one can access S.U.M. records and other corporate documents, and study original letters that Hamilton and L’Enfant wrote to advance the industrial incubator. As a scholar, I assure you that these resources can be used to illustrate the connections between ideas, actions, and results. But besides the historical facts, there is another important and strategic reason to feature Hamilton at the new national historical park. His personal story–the illegitimate child and orphan who comes to America as a penniless immigrant and then by dint of native intelligence, personal bravery, and plain hard work rises to the top ranks of history’s great statesmen and financiers–is one that should really resonate in our nation of immigrants and the children of immigrants. Hamilton dreamt and then lived the American dream, and did so much to make that a possibility for countless others. The Paterson Great Falls National Historical Park should relate that uplifting story to all who come to it to learn about a key person and a key site in the rise of the American nation.